The biggest builder’s show on the west coast lived up to the hype – we had an amazing experience in San Diego at the 2017 PCBC. ThermalBuck was fortunate to head into the show a Parade of Products award winner (featured in the May 2017 issue of Professional Builder Magazine) and a presenter in the High-Performance Home Theater. But the real excitement started when we hit the tradeshow floor. ThermalBuck was a featured product in the High Performance Wall & Attic display, designed to show homebuilders a variety of innovative building envelope products & methods they could use to comply with the 2016 Title 24 Energy Efficiency Standards. Watch as energy-efficient building consultant Nick Brown of Build Smart Group walks us through the exterior of the High Performance Wall & Attic display, built by Reliable Lumber of Huntingdon Beach. Other products featured in the display included Sierra Pacific windows, DuPont Flashing, RMax insulation, Parex One-Coat Stucco, Sun Power solar panels, and more. The display & home-theater presentations were the result of a collaboration between the California Homebuilding Foundation (CHF), California Energy Commission (CEC) and the Workforce Instruction for Standards and Efficiency (WISE) program. The WISE program brings high performance building training to residential builders in California, and plays a significant role in the success of energy-efficient code adaptation in the state. To learn more about upcoming WISE events & initiatives, visit wisewarehouse.org. Next up was a quick-spot on The Carey Brothers “On the House” radio show, which featured ThermalBuck as one of the “latest and best products” from the PCBC show. We were in great company with Ply Gem, OXX, Air King, and Boral Roofing to name just a few. The Carey Brothers were very knowledgeable, and great fun – we really appreciated the opportunity to connect with their listeners. When we said that we had an amazing experience in San Diego, we weren’t kidding! Last but not least of our highlights from the show was our visit from Nigel Maynard, Editor of Products Magazine, for residential construction professionals. Nigel wrote about the top 8 products that “caught his eye” at the show, and we were proud to have gotten notice as one of the standouts from the show. The list featured a mix of interior and exterior products, including PURewall by Covestro, Stretto door hardware by Emteck, and the new Smart All-in-One Care Washer & Dryer by Whirlpool. Take a look at the complete list here. The Pacific Coast Builder’s Conference (PCBC) is the largest homebuilding trade show on the West coast. Over 10,000 homebuilders, architects, contractors, remodelers, engineers, and manufacturers will converge in San Diego June 27th-29th, 2017 for this year’s event. Originally known as the “Pacific Coast Builder’s Conference”, the PCBC show has grown since 1959 to attract attendees from all over the world. Here’s more of what was happening at PCBC 2017 – don’t miss the show in San Francisco in 2018! Did we mention we won a POP award??? We definitely see the benefits! The largest homebuilding trade show on the West coast, the PCBC, will be held June 28th-29th in San Diego, California. Originally known as the “Pacific Coast Builder’s Conference“, this event has grown since 1959 to attract over 10,000 attendees from all over the world. One of the unique features of the PCBC is the High Performance Home Theater. Held right on the exhibit floor, it focuses on educating attendees about multiple compliance methods for changing energy codes, particularly the 2016 Title 24 Standards mandating High Performance Walls & Attics. ThermalBuck presents “Solving the Challenge for Builders: Window Installation with Continuous Insulation” as part of the High Performance Home Theater on Thursday, June 29th, 2017. Mark your calendars for 11:30 am, and join us to learn more about how ThermalBuck can simplify your window installation with continuous insulation, and limit thermal bridging in the building envelope. View a complete listing of High Performance Home Theater presentations here. Thousands of homebuilders, architects, contractors, remodelers, engineers, and manufacturers from the US, Canada, Mexico (and more than 25 other countries) will meet in California to discover the latest trends in homebuilding innovation. Not only does the trade show floor feature over 350 exhibitors, the Parade of Products and the High Performance Home Theater, it also offers purchasing agents two different buyer events to maximize their time and focus on meetings with the manufacturers of their choice. The National Buyers Circle is an invitation only event, while The Key Buyers Club is open to all exhibitors. To learn more about the differences between these two programs, click here. Unique to the PCBC, is the endorsement by the Leading Builders of America (LBA). Teams of national and regional buyers from 20 of the largest publicly and privately held homebuilders in the US meet with PCBC exhibitors, and collaborate to develop the high-level programming for members in the invitation-only, Leader-to-Leader Forum. The show is sponsored by the California Building Industry Association (CBIA), a statewide trade association dedicated to “building California’s economy by providing quality environmentally responsible housing, creating tens of thousands of good paying jobs, and generating billions in state and local revenues”. Consider attending the 2017 PCBC, and see for yourself how this event provides unique opportunities for homebuilders and manufacturers to connect. Get your FREE exhibit floor pass (use promotional code HANK17), and visit us at Booth #120 June 28th & 29th. You’ll leave the PCBC feeling inspired about the future of energy-efficient building. View a complete schedule of events, and register to attend the 2017 PCBC here. Plan your visit to the San Diego Convention Center by viewing this complete list of exhibitors on the 2017 PCBC floor plan. ThermalBuck is proud to announce our selection as one of the “Best of PCBC: 2017 Parade of Products” by Professional Builder Magazine. Each year, exhibitors for the PCBC are invited to submit new products to a distinguished panel of judges for consideration as one of the 15 winners of the Parade of Products. Awards are based on innovation, practical application, and design. Panel members represent a variety of backgrounds in homebuilding: engineers, designers, architects, and product curators. ThermalBuck, the high-performance window buck, made the cut along with an innovative roof deck insulation by Knauf made from sand, a rollable furring strip recently launched by Keene Building Products, and several wi-fi connected products, all designed to reduce energy usage. POP winners will receive highlighted media coverage in advance of the show, as well as on the exhibit floor. View the complete listing of winners from the Professional Builder Best of PCBC 2017 Parade of Products here. Professional Builder is the official media sponsor of the PCBC, the largest homebuilding trade show on the West coast. Over 10,000 homebuilders, architects, contractors, remodelers, engineers, and manufacturers will converge in San Diego June 27th-29th, 2017 for this year’s event. Originally known as the “Pacific Coast Builder’s Conference“, the PCBC show has grown since 1959 to attract attendees from all over the world. 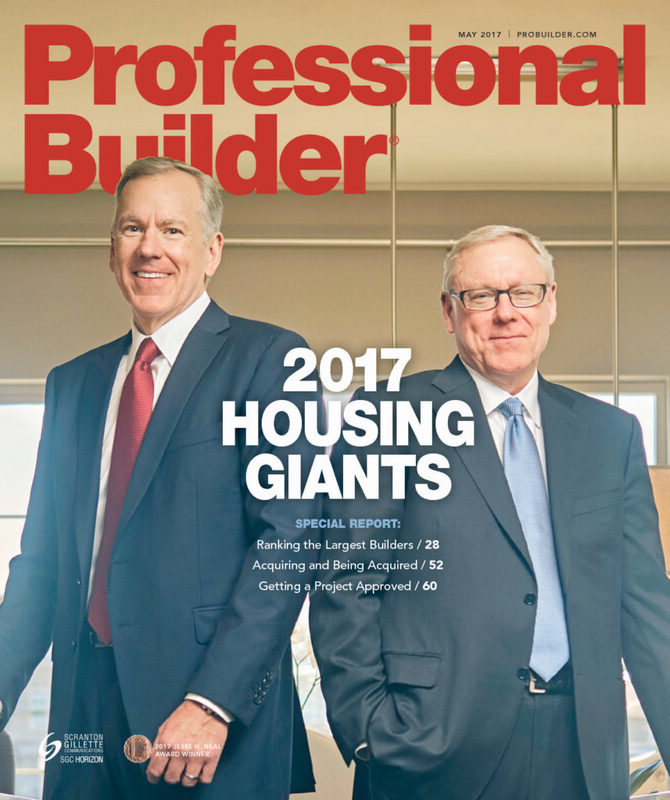 Professional Builder magazine has been a staple of the home building community for over 75 years. 100% of the home building professionals who value Professional Builder as a resource have authority to specify and/or purchase building materials, products, and equipment. Product submissions for the POP awards must have been launched within the last 18 months, or be available the upcoming fall.